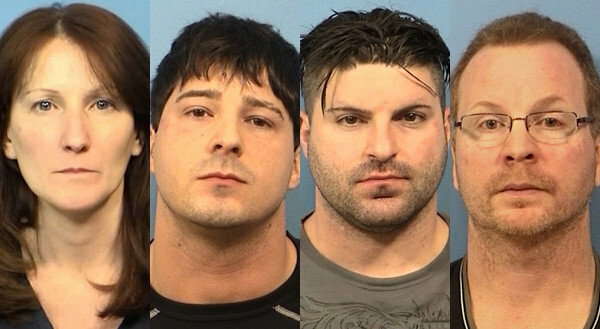 Three police officers in Schaumburg, Illinois (outside Chicago) have been indicted for allegedly teaming up with a drug dealer to sell narcotics. Matthew Hudak, John Cichy, and Terrance O’Brien were all members of the tactical unit and charged with a female companion, Nicole Brehm, 44. The dealer had served as an informant for the officers when he became their business partner. The cops would steal cash and drugs from other dealers and the informant would then sell the drugs. Hudak, 29, allegedly used police computers to keep track of his “partner.” Brehm, 44, was O’Brien’s longtime girlfriend and the mother of one of his children. She allegedly allowed drugs to be stored at her house. O’Brien, 46, is married with four children. The DEA put together a sting concerning an associate from out of town and the officers went to a unit to steal $20,000. They were captured on camera breaking into the unit wearing masks and taking the money. Strangely, they brought the money back and then returned and took it again. Cichy was caught on video lifting his mask. The DEA later found the bait money in the homes or possession of the three different officers. Some of these offenses come with a 40 years maximum sentence and former police officers tend to be sentenced at the high end due to the aggravating elements of betrayal of public trust and misuse of public office. What So Proudly We Hailed at Beyoncé’s Lip Syncing . . . When a legal system condones and, indeed encourages ‘stings’, this is the result. They should have worn a suit and tie when committing their crimes. Those guys seem to get off with a slap on the wrist. Wow, this is a very serious crime. I do not understand why they would do something so ridiculous and think they could get away with it. Thanks so much for sharing!